Sorry for the lousy photo above, but don’t let it stop you from making this delicious tart. I found this fabulous recipe over at Smitten Kitchen, and I’ve made it twice so far, to rave reviews. Even Master Chow, my honorable husband, fell in love with this, although he was skeptical that zucchini in a tart shell was much to rave about. What I changed: I doubled the filling and added a bit of Dijon mustard to the recipe. That’s it. This is a winner and I’ll be baking it often! Recipe after the jump. Make dough: Whisk together the flour and salt in a large bowl. Sprinkle bits of butter over dough and using a pastry blender, cut it in until the mixture resembles coarse meal, with the biggest pieces of butter the size of tiny peas. In a small bowl, whisk together the sour cream, lemon juice and water and add this to the butter-flour mixture. With your fingertips, mix in the liquid until large lumps form. Pat the lumps into a ball; do not overwork the dough. Cover with plastic wrap and refrigerate for 1 hour or overnight. Or, whir the whole thing in a food processor, taking care not to overmix. 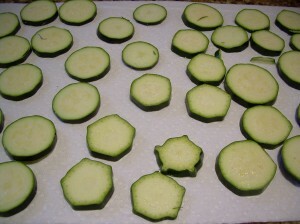 Make filling: Spread the zucchini out over several layers of paper towels. Sprinkle with 1/2 teaspoon salt and let drain for 30 minutes; gently blot the tops of the zucchini dry with paper towels before using. In a small bowl, whisk the olive oil and the garlic together; set aside. In a separate bowl, mix the ricotta, Parmesan, mozzarella, the basil leaves, and 1 teaspoon of the garlicky olive oil together and season with salt and pepper to taste. Prepare galette: Preheat oven to 400 degrees. On a floured work surface, roll the dough out into a 12-inch round. Transfer to an ungreased baking sheet lined with parchment paper. Spread a THIN layer of Dijon mustard over the dough, and then the ricotta mixture evenly over the bottom of the galette dough, leaving a 2-inch border. 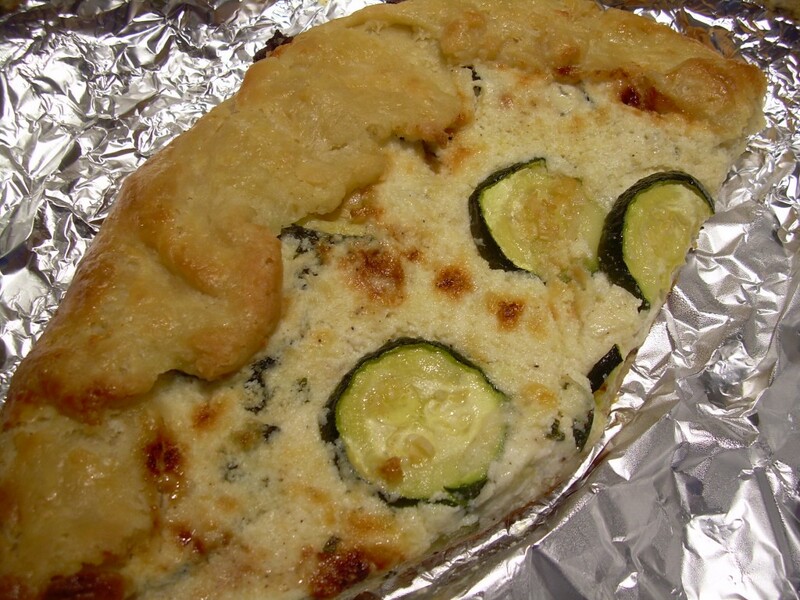 Shingle the zucchini attractively on top of the ricotta in concentric circles, starting at the outside edge. Drizzle the remaining tablespoon of the garlic and olive oil mixture evenly over the zucchini. Fold the border over the filling, pleating the edge to make it fit. The center will be open. Brush crust with egg yolk glaze. Bake the galette until the cheese is puffed, the zucchini is slightly wilted and the galette is golden brown, 30 to 40 minutes. Remove from the oven, let stand for 5 minutes, then slide the galette onto a serving plate. Cut into wedges and serve hot, warm or at room temperature. WOW…hat a fantastic way to use up my summer haul of zucchini! It looks so golden, puffy and delicious!